Everything works fine into Firefox 50.1.0 and Firefox 52.0a2 DE. Sigh. Jira appears to be using an ancient version of the momentjs library, that improperly feature-detects Node as being anything with a "global" global property. The moment folks fixed this in https://github.com/moment/moment/commit/1601cb1dd7b14277ba8b00cb2ece3ce637923080 which Jira seems not to have started using yet. > that improperly feature-detects Node as being anything with a "global"
Shouldn't the original line - `globalScope = typeof global !== 'undefined' ? global : this` - continue to properly set `globalScope` to the global object, since `global` is that? So before A would define moment on the z object, now it's being defined on the global. Ah, I didn't expect anyone would want to do that. Thanks for explaining. Jeff, I think we should disable this feature until jira fixed the issue and made a new release. Otherwise, we are going to lose users to our competitors. We should synchronize with our competitors on enabling this new feature. Could you please disable the global keyword or backout the changes? It has been backed out already, see bug 1317422 comment 17. By the way, did we report a bug to jira to make sure that they update their version of moment? Safari Technology Preview 21 was just released with `global` support. JIRA v6.2 seems to be working fine for me. 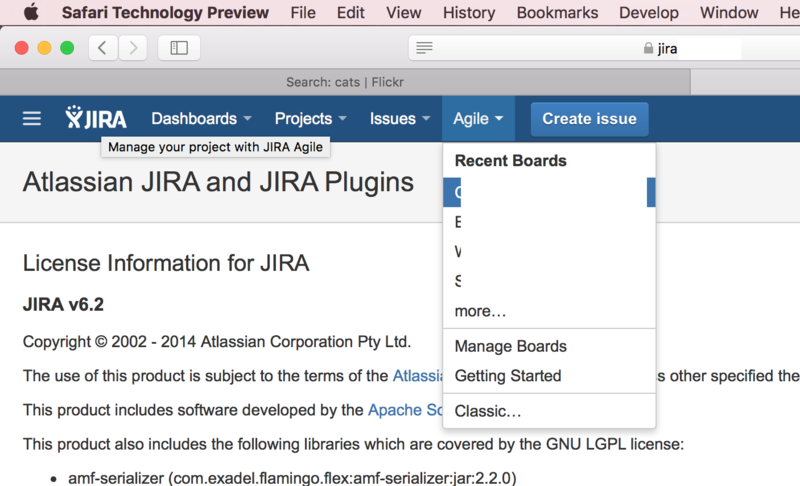 JIRA 6.2 is too old to show the bug (it was released in early 2014). Viewing jira.atlassian.com (JIRA version 7.3) in Safari Technology Preview 21 fails for me. This was backed out in https://bugzilla.mozilla.org/show_bug.cgi?id=1317422#c19 (2 weeks ago). Simounet can you confirm it works in the latest Nightly and close if so? I can confirm this is fixed. Thanks!